Cockpit Step – April 2014. Both Marya and I are too short to see over the dodger when standing behind the wheel flat footed. We hate looking through the dodger when operating in close quarters so for the past 4 years we have been standing on a buoyancy throw cushion. While cushy, it is not that stable and easy to roll an ankle on the edges. So I decided to build a small platform instead. 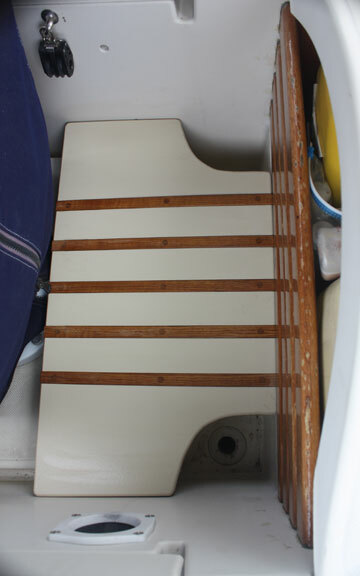 I mocked it up out of plywood first, made a couple of changes, and then made the final piece out of ¾” tan Starboard. It was pretty straight forward to make the base (basically a grid to distribute the weight, and then screw it together with countersunk stainless screws. I was worried about the starboard being a little slick when wet, so I routed out some grooves and added teak runners that stand slightly proud to give traction. The teak runners were screwed down and then teak bungs added to hide the screw heads. Overall, it came out well, I think, and it has worked really well while sailing.